Bird and Squirrel are almost home. All that's left for them to do is cross the Great Mountains. But before they can, the duo stops to chase off wolves hunting a baby bear and in the process Bird gets a knock on the noggin that gives him amnesia. Now Squirrel has to set aside his fears and keep both Bird and the bear cub safe as they journey on foot over the mountains. But witha pack of hungry wolves on their tail, can Squirrel step up and be the leader they need to keep them all alive? James Burks spent 15 years working in the animation industry on various movies and television shows, including The Emperor's New Groove, Atlantis, Treasure Planet, Space Jam, The Iron Giant, Wow Wow Wubbzy, and most recently on Fan Boy & Chum Chum. 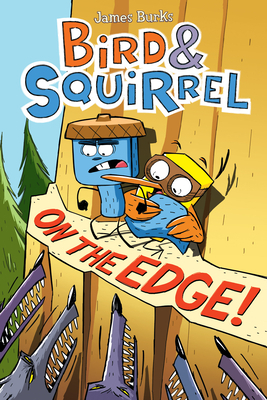 James is the author of the Bird & Squirrel graphic novel series for Scholastic, as well as the illustrator for the Branches series Haggis and Tank Unleashed. James lives in Valencia, California.